the last part detailed the pretty serious mistakes I made with the first batch of cameras I found. the high probability that I’d destroyed photos saddened me, but I didn’t let it stop me. I thought about how I could do things better the next time. but before I could do that… I had to find more film. each time I’d go home to Bremerton, Washington I’d take a trip around the local thrift stores. St. Vinny’s, Value Village, Goodwill. I had a circuit that I’d go. Most of the trips were with my sister, Teal. Sometimes our Mom joined us as well. almost every time I’d go back to the stores I’d find cameras. it didn’t matter if it’d be 2 months or 6. it was mind boggling that so many people would be getting rid of their photos. I mean, we all know that story where the person leaving the burning house stops to get the photo album. these photos were their memories… and in a weird way a record of their lives. so what did it mean for me, a stranger, to find them? I was still working out thematically what exactly the project meant to say. (hey, I went to art school – these are things we think about). but beyond that, I was fascinated that this would happen at all. it became an obsession. each time I’d come home I had to go look more. at the stores I’d head straight for the cameras and begin to search. I got to the point where I could often tell if a camera had film in it by the additional weight. Each time I flipped a camera over and saw the film canister through the window I got a little rush. in the midst of people shopping for clothes, dishes, and old furniture I was on a treasure hunt. none of the other customers knew my goal. 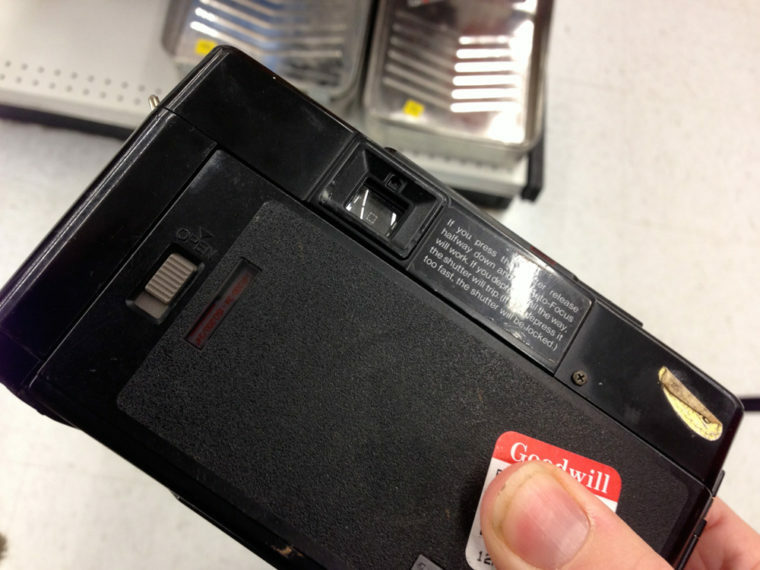 no employees had an inkling as to why I was buying piles of old, seemingly worthless cameras. I was in my own special world. it was like I knew a secret no one else did – that these camera held the stories of strangers. it was pretty dang exciting. after several trips I’d amassed a pretty good collection. the next step was to unload them. and this time to not ruin the film in the process. in the next part, “Unloading Cameras, The Right Way” I apply the lessons I’d learned and begin to think about the future of the project.